With how magical the 2018 Red Sox season was, it would be only fitting for Boston to bring the same team back in 2019, right? Wrong. See the 2014 season for reference. Yes, they lost Jacoby Ellsbury and Jarrod Saltalamacchia—replacing them with Grady Sizemore and A.J. Pierzynski—but in essence, the same team that clinched at home in late October of 2013 started Opening Day the following year in Baltimore. The 2018 Red Sox won the World Series on the back of performances by key players in expiring contracts like Nathan Eovaldi, Joe Kelly, Steve Pearce, Craig Kimbrel, and yes, Ian Kinsler as well. It’s not totally out of the realm of possibility for most of that list to return, but for those who don’t, who would make a good replacement? In a deal that cost the Red Sox a couple of prospect relievers, the Kinsler experiment had its ups and downs. The 36-year-old got hurt in his first series in a Sox jersey and never seemed to get his feet wet in Boston. He had his moments, but not enough to really garner any desire for a potential return in 2019. With Dustin Pedroia set to return in 2019 after an injury-plagued 2017 and 2018, it only makes sense that management would lean towards him over Kinsler next season. In all honesty, that’s how it should be. There have been reports linking the Red Sox to D.J. LeMahieu, but it doesn’t make much sense to sign another second baseman. 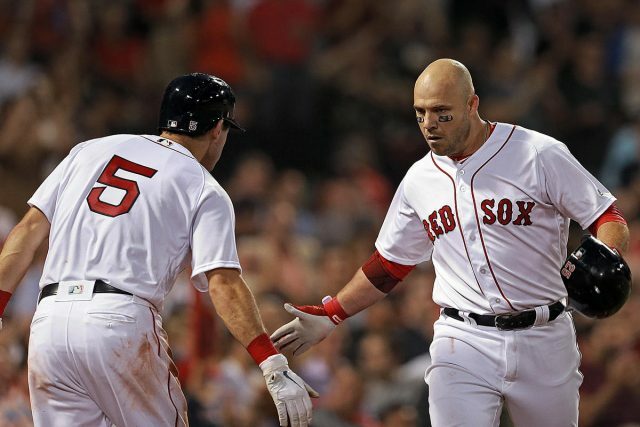 Steve Pearce stole the hearts of Red Sox Nation with his iconic three home run game against the Yankees in early August—then proceeded to run the show in Games 4 and 5 in the World Series. However, he’s 36-year-old, and the likelihood of him returning to provide that jolt in 2019 is slim. This just feels like another Mike Napoli situation. As for why Hanley Ramirez would make sense, it’s a platoon situation. While he was invisible for the month of May—leading to his release—he still hit .333 with a .854 OPS vs. LHP in 2018. His lack of desire to play anywhere else in 2018 also adds a little bit to the dynamic. Did he want to assure he could be available to the Red Sox for 2019? Who knows. But he would be a cheap option, who can still provide a source of power. Oh, and he’s a career .380 hitter in the postseason, so there’s that. Nothing compares to the level of crazy that Joe Kelly possesses. Never will we forget the fact he said the thought of a gun to his head calms his nerves and then he proceeded to absolutely shove in the World Series. He said he definitely wants to resign in Boston, but there’s always the possibility that he will go elsewhere. Why would Kelvin Herrera be the best replacement? He brings an electric fastball, with an equally electric personality. However, taming it has always been a problem for the 29-year-old. Think back to the incident between him and Brett Lawrie back in 2014 for reference. That being said, the dude is dominant and would actually be an upgrade over Kelly. Craig Kimbrel did what he was asked in the 2018 postseason. Even if it wasn’t pretty, he never completely faltered. He was perfect in saves, despite carrying a 5.91 ERA in the 2018 postseason. That was just a microcosm of how the second half went for Kimbrel. In 22 outings after the break, the right-hander had a 4.57 ERA—which included a stretch in which he was struggling to hit the upper-90s with his fastball. If he is losing velocity, he loses effectiveness. He seems to be the most likely player to leave in free agency this season. As for why Familia is the best replacement, he brings an average of 96+ MPH on both his sinker and his four-seam fastball, which is only 0.5 less that Kimbrel’s average fastball velocity of 97.1 MPH. Plus he is a year younger than Kimbrel, won’t garner a $16 million per year contract, and he has closing experience in the past. What a story this Nathan Eovaldi guy has become, eh? Two Tommy John surgeries bounced around from the Dodgers to the Marlins, Yankees, and the Rays until he arrived Boston—where he finally seemed to fit into the team’s plans. He was electric in his first career postseason, going 2-1 with a 1.61 ERA in 22.1 IP. However, he was so good that it might give him a big-time payday this offseason. While it would make sense for both parties for him to return, money talks in this league. If someone pays him $20 million, he’d be foolish to walk away from it. Garrett Richards gives off Eovaldi vibes. He burst onto the scene in 2014 with the Angels—going 13-4 with a 2.61 ERA in 26 starts before he tore his ACL. Since that season, he’s made just 60 starts—15 per season on average. But there’s no denying the talent is there, so he’d make a very cost-efficient signing should Eovaldi walk this winter. 2 comments on "Leandre: Best Replacement for Each Notable Red Sox Free Agent"
bring hanley back, are you crazy? Interesting! I’d really like to see them bring Eivaldi back.